Different animals eat different diets, in part because they have different types of teeth. The piercing and tearing teeth of a carnivore, for example, in comparison to the flat chewing teeth of a plant-eater. Think tigers versus cows, for terrestrial animals. Among sharks, contrast the thousands of tiny teeth of the whale shark - which may play no role at all in the feeding of this planktivorous species - with the dagger-like teeth of “toothy” sharks like the great white. A new study takes this analysis of shark dietary adaptation one step further, examining the structure of shark jaws, and how their shapes allow different species to eat different types of prey. The study by Ferrar et al describes an analysis of the jaw structure and musculature of the sandtiger shark and the white shark, two species with very different types of teeth. White sharks’ wide sharp teeth easily rip pieces of flesh from large prey like seals, while the long, thin teeth of sandtigers are designed to pierce and hold fish that are swallowed whole. But are teeth the only determinant of prey choice? What about the jaws themselves? 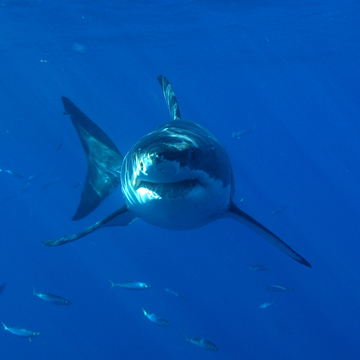 Ferrar at al found that the force with which a shark can bite, and how widely it can open its mouth to deliver that bite, also influence the choice of prey. They used a medical CT imaging scanner to generate digital models of white and sandtiger shark jaws, and measured “bite force” at various “gapes”, i.e. with the mouth open from 5 to 55 degrees. In mammals, bite force decreases the wider the gape, and each animal has an ideal gape to deliver the most forceful bite. While these sharks were found to exert powerful bites over a wider gape range than mammals, there were differences between the two species. White sharks bite with maximum force at a greater gape than do sandtiger sharks - an optimization that likely helps them to eat larger prey like seals and whales. Interestingly, this is not something a white shark is born being able to do. By studying subadult sharks, the authors found that the jaws of young animals are weaker than those of adult sharks. This likely explains why young white sharks eat mainly fish prey, until their jaws mature to enable feeding on marine mammals. Who eats who in the ocean results from a highly complex dynamic of size, habitat and morphology, among many other variables; jaw structure is now shown to be one more variable in the mix.